Theodore Roosevelt Jr. was an American statesman, author, explorer, soldier, naturalist, and reformer who served as the 26th President of the United States from 1901 to 1909. As a leader of the Republican Party during this time, he became a driving force for the Progressive Era in the United States in the early 20th century. Born a sickly child with debilitating asthma, Roosevelt successfully overcame his health problems by embracing a strenuous lifestyle. He integrated his exuberant personality, vast range of interests, and world-famous achievements into a “cowboy” persona defined by robust masculinity. Home-schooled, he became a lifelong naturalist before attending Harvard College. His first of many books, The Naval War of 1812 (1882), established his reputation as both a learned historian and as a popular writer. Upon entering politics, he became the leader of the reform faction of Republicans in New York’s state legislature. Following the deaths of his wife and mother, he took time to grieve by escaping to the wilderness of the American West and operating a cattle ranch in the Dakotas for a time, before returning East to run unsuccessfully for Mayor of New York City in 1886. 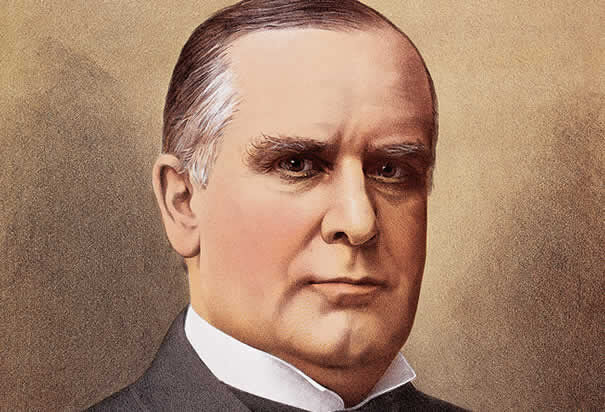 William McKinley was the 25th President of the United States, serving from March 4, 1897, until his assassination in September 1901, six months into his second term , resigning after one year to serve with the Rough Riders, where he gained national fame for courage during the Spanish–American War. Returning a war hero, he was elected governor of New York in 1898. The state party leadership distrusted him, so they took the lead in moving him to the prestigious but powerless role of vice president as McKinley’s running mate in the election of 1900. Roosevelt campaigned vigorously across the country, helping McKinley’s re-election in a landslide victory based on a platform of peace, prosperity, and conservatism.